Hello its almost the middle of spring!! Holy moly how fast time is flying by - soon its going to be summer!! I decided to create a happy summer scene in the celebration of the warmth to come - yay!! I created the scene in this card with 99% FELT and ALL DIES from Taylored Expressions!! 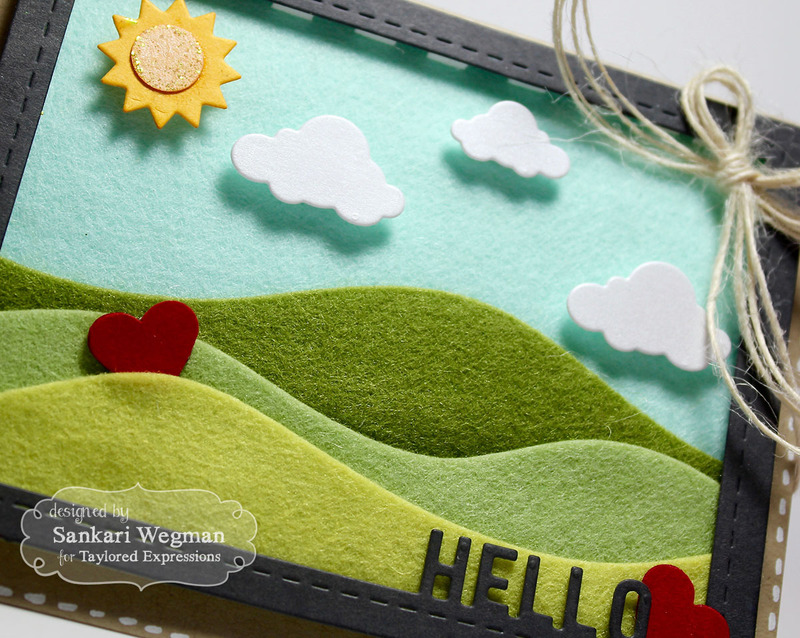 I love all this texture that the felt creates - especially creates a feeling of grass on the hills created using the Build A Scene dies - Rolling Hills. All three hills that come in this set of dies were created by die cutting: Avocado Felt, Split Pea Felt and Pear Felt. I loved making a card that was created with all dies and all felt! Such a fun way to create cards! Hope that you are all having a great day! I've shied away from felt until now, as I was not sure what glue to use to adhere pieces to each other and to my cardstock card. Looking at your list of supplies, I see that you've used the "Best Glue Ever." Is this what you recommend using for felt? Thanks for your assistance!! Again, I ABSOLUTELY LOVE your card! !